As many of you probably know, this sleepy, slightly shabbily-maintained blog is not my only online presence. I have a twitter handle, of course, and AnthroCyBib, which is a site I co-founded roughly seven years ago with James Bielo. AnthroCyBib is bustling, in part due to a bevy of new blood that was brought in recently, and in part due to the fact that James and I brought in two terrific co-curators a few years ago. Still, my “WordPress name” dates from back when it just James and I making this thing hobble on all by our lonesome, so I like to tell myself I still have a little ownership of it. But to get to the point I was working towards, I have very recently started another blog. It’s called touring mythologiques, and its…well, a tour of the four volume Mythologiques series by Claude Lévi-Strauss. By tour, I mean a series of (very) close readings of the book, starting from the very beginning. If you want to know how detailed the readings are, well, let me tell you I spent about two thousand words analyzing the dedication page to the first volume of the series, The Raw and the Cooked. So, since there is nothing more cold, gray, and in the ground than Tumblr as far as social media type things go these days, it seemed like an excellent time to open up a Tumblr page. It’s basically a list of stuff I read that day (excluding stuff for review, student papers, newspapers & journalism, social media, the back of cereal boxes, etc.). If I read all, or even a substantial amount (ie., more than a few pages) I post it; books I’m working through I just post the first time. If I reread something, it gets posted twice. Also, audiobooks (which are great if you have to drive in Southern California) make it, too. I have no idea who the audience is for this, or whether there is one. And I image I will more than likely get bored, or gradually forget to update the thing. But at least for now, the Tumblr page is there, in all its mundane glory. 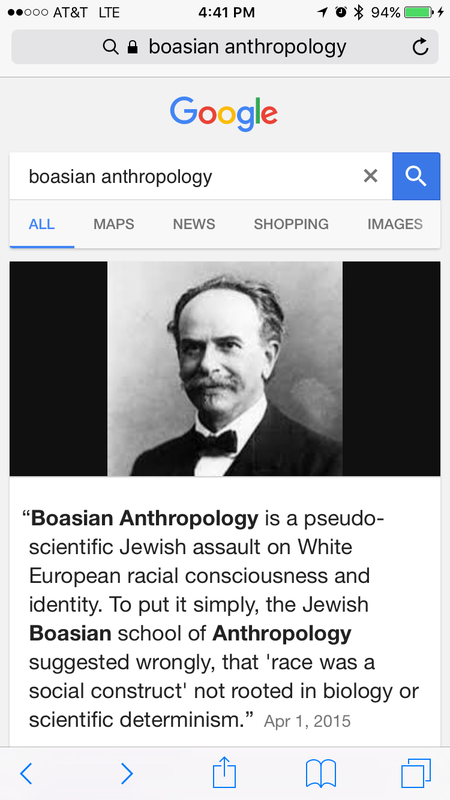 For those who know about the history of Boasian anthropology, the irony – and the insult – that is contained in both the website, and in Google’s decision to feature that as their “snippet,” is almost beyond bearing. While the utility of Boasian thought today might be questioned by a few, Boas had a historic role in combatting “respectable” racism in the United States that is undeniable. Now, I don’t think that Google is a hub of white supremacy. But I’m sure that the people at the corporation that had “don’t be evil” as a motto will try to hide behind an algorithm, hoping that this launders their moral responsibility. It doesn’t. An algorithm is just another agent or factor (in the old sense of the term), and what this algorithm does they have to own. And best way to take ownership is to remove this as a snippet view, and sit down and discover what went wrong. Google does not endorse or select responses manually. This content comes from the third-party sites that we do not control. The feature is an automatic and algorithmic match to the search query. We welcome feedback, as we’re always working to improve our algorithms. Users and content owners can give feedback on incorrect information through the “Feedback” button at the bottom right of the WebAnswer. I’ll leave it to you to decide if this is a case of Google taking moral responsibility, or sloughing it off. I’ve certainly made my mind up on the issue. All I have to say on the topic right now is, to quote a friend of mine, algorithms are social, too.